Free Shipping Included! 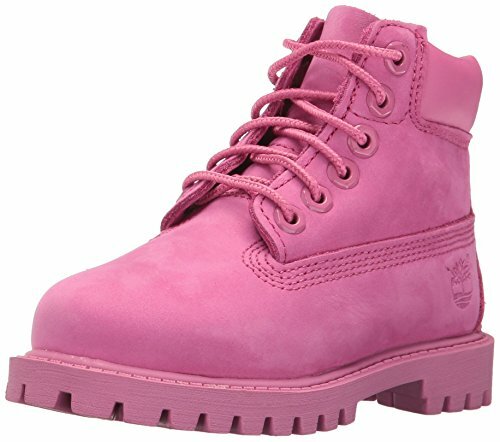 Timberland Kids Baby Girl's 6'' Classic Boot (Toddler/Little Kid) Iris Rose Nubuck Boot by Timberland at Blood of The Young. MPN: 00_446119_R8. Hurry! Limited time offer. Offer valid only while supplies last. Cool weather calls for these cool boots from Timberland® Kids. Smooth leather upper with knitted collar. Lace-up closure for easy on and off. Cool weather calls for these cool boots from Timberland® Kids. Smooth leather upper with knitted collar. Lace-up closure for easy on and off. Rustproof hardware for durability. Textile lining and cushioned insole. Flexible, wide-tread rubber lug sole for durability and abrasion resistance. Imported. Measurements: Heel Height: 1 in Weight: 9 oz Shaft: 3 1⁄2 in Product measurements were taken using size 8.5 Toddler, width M. Please note that measurements may vary by size. Cool weather calls for these cool boots from Timberland® Kids. Smooth leather upper with knitted collar. Textile lining and cushioned insole. Flexible, wide-tread rubber lug sole for durability and abrasion resistance. Imported. Measurements: Heel Height: 1 in Weight: 9 oz Shaft: 3 1⁄2 in Product measurements were taken using size 8.5 Toddler, width M. Please note that measurements may vary by size.